Vintage fuzz revamped to be splendidly versatile and slot right into a modern pedalboard. 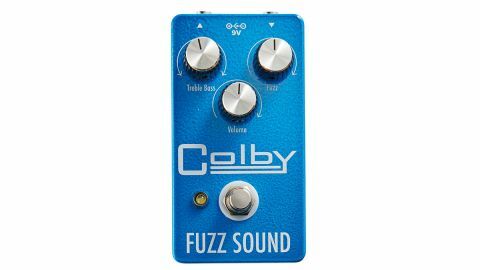 A collaboration between EarthQuaker Devices and Colby Amps has resulted in the Colby Fuzz Sound, known as the Park Fuzz Sound in the USA, as Colby has the rightsto the name there. Park was Jim Marshall's alternative company back in the 60s and the original Park Fuzz Sound from those days was a branded version of a Tone Bender. This new pedal takes that design, complete with matched NOS Germanium transistors, and packages it in a more practically sized pedal with extra gain and tone control range, alongside all of the expected modern facilities: standard nine-volt power, true bypass, and so on. What you get is great-sounding late-60s fuzz that's surprisingly versatile in its range - thanks mainly to the tone control, which to the right adds low-end warmth for fat, sustaining vocal leads that'll sustain forever, while offering more of a buzzy, ripped-Velcro rasp to the left. We like it best with the fuzz maxed and controlled with the guitar volume knob. Classic.